These blueberry waffles are fluffy and delicious, made with fresh or frozen blueberries and a simple batter. Beaten egg whites are folded into the batter before the waffles are cooked. These waffles are delicious with maple syrup or use the fresh blueberry syrup (recipe below). If you're using fresh blueberries, set some aside for garnish. Blueberry Sauce - combine 2 cups of blueberries in a saucepan; mash or crush. Add 1/3 cup of granulated sugar, 1 tablespoon of lemon juice, and a dash of salt. Bring to a boil over medium heat and continue boiling for 1 minute. Remove from the heat and add 1/4 teaspoon of vanilla extract. 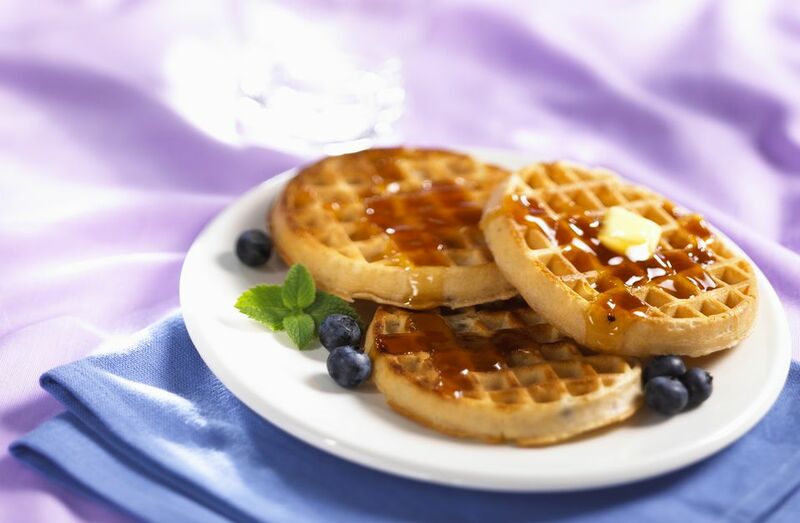 Blueberry Lemon Waffles - Fold about 1 tablespoon of finely grated lemon zest into the batter. Freeze leftover waffles in small freezer bags. Reheat in a 325 F oven for about 8 minutes or reheat in the toaster. In a small mixing bowl, beat the egg whites until stiff; set aside. In another bowl beat the egg yolks; add milk and melted butter. Sift dry ingredients together; add to the egg yolk mixture and mix until smooth. Fold in blueberries. Gently fold in beaten egg whites.